Buy 2 Promax Extreme for 65,00EUR each! 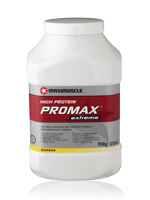 Buy 3 Promax Extreme for 60,00EUR each! Taking protein drinks to the ultimate level, Promax Extreme takes Maximuscle's popular and highly effective Promax protein powder to new levels and is considered the 'number one' of protein powders. Promax Extreme contains a collection of 7 unique ingredients including high dosages of glutamine, creatine and Beta-Ecdysterone, a plant used by "Eastern Bloc" strength and power athletes to help increase muscle mass during training. Promax Extreme includes a unique Biomax® blend of whey isolate, hydrolysates and peptides, providing ultra fast delivery of muscle building amino acids after every workout. Biomax is rich in BLG protein fractions that deliver high levels of Branch Chain Amino Acids (BCAA's) to your muscles. Glutamine is the most utilised amino acid during training and Promax Extreme delivers 5g per day to ensure optimum muscle recovery and growth. The addition of creatine gives you the muscle building punch you expect. If that wasn't enough, a unique collection of the amino acid Taurine, N-acetyl-Cysteine (NAC) and the physique enhancing polynicotinate form of Chromium have all been added at potent levels. All the above makes Maximuscle's Promax Extreme one of the most advanced protein products available for anyone looking to achieve their lean muscle and strength goals faster than ever. If you want nothing but lean whey protein with all the extras thrown in and almost zero carbs or fats - this is for you!